1. To make the pastry, add the flour, icing sugar and butter to the bowl of a food processor or mixing bowl and rub in the butter until the mixture resembles fine crumbs. Add the egg yolks and vanilla and mix to a soft ball. 2. Preheat the oven to 190°C, 170°C fan assisted, Gas 5. Roll out the pastry on a lightly floured surface and stamp out 9.5cm (3¾ inch) circles with a plain or fluted biscuit cutter and press into sections of 12 hole buttered muffin tin. 3. Reroll the trimmings and continue until all sections of the muffin tin are lined. Prick the bases of the tarts with a fork and chill for 30 minutes. 4. Line each tart case with a square of non-stick baking paper and line with baking beans then bake blind for 8 minutes, remove the paper and beans and bake for 3-4 minutes until bases are crisp and the top edges pale golden. 5. Reduce oven temp to 170°C, 150°C fan assisted, Gas 3. To make the filling lightly whisk the eggs, egg yolks, icing sugar and vanilla together then add the cream and whisk briefly until smooth. 6. Strain the custard through a sieve into a jug. Pour into the baked tart cases then add 3 raspberries to each. Bake for 15-20 minutes until the custard is just set then leave to cool in the tins. To serve, loosen the tarts with a knife then remove from the tin, serve as they are or lightly dusted with sifted icing sugar. 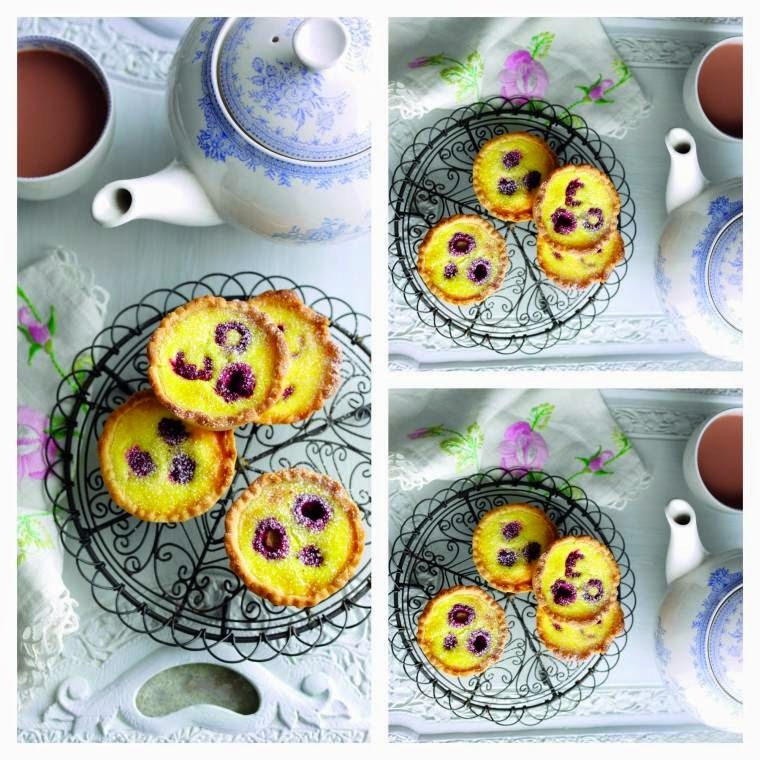 As small tart cases are a bit fiddly to make, why not make double the quantity if you have two muffin tins. Line both tins, chill and bake the tarts then freeze half of the plain tart cases, defrost and fill later for an easy dessert. "The Milk Race : And A Flashback Friday….."
These sound delish. I want a cpuple right now for breakfast! They are gorgeous too, by the way. These look beautiful and tasty. Visiting from Create w/Joy Blog Hop. I looooooooooove these little cute tart!! Do send me some – pleasssssssssssssse. We don't have here fresh raspberry….